Oil-less turkey fryers - Pros? Cons? | Smoking Meat Forums - The Best Barbecue Discussion Forum On Earth! Oil-less turkey fryers - Pros? Cons? Discussion in 'General Discussion' started by scvinegarpepper, Nov 25, 2010. I hope this is in the right forum. I couldn't find anywhere else that seemed appropriate. After many, many years of frying turkeys using a propane burner and gallons and gallons of oil, I'm thinking of making the switch. The oil is a pain and expensive too. But I've heard mixed reviews on the oil-less fryers. I use a heavy rub on my birds and love the crispy skin the oil creates. Will I still be able to get the same results? I'm just scared to drop the cash for one and then be disappointed. I'd love to hear some honest opinions on them. Also, how long does the process take? For example, in oil I usually fry at 350* for about 3.5 mins per pound. How does this compare to the oil-less fryers? Thanks everyone, have a safe and happy Thanksgiving. I've been really interested in one too for the same reasons, and also hearing mixed reviews. If it produces nearly the same product it should certainly be worth the money, considering the oil cost, pain of recycling, cholesterol concerns, etc. Hopefully someone in the know comes along soon to clear it up for us. I am frying up a bird as i type! any way I have never owned a oil less fryer but I was going to make the switch myself but in most cases if it sounds to good to be true then it usually is. I read hundreds of reviews on the oil less fryers and from what I gathered they do seem to work but 90% of them said that it is not like fried turkey but more like roasted turkey!! they take about 2 hours to cook a 18lb bird and use up lots of propane. I like the crisp skin and the overall taste of fried Turkey so I decided to stick with the oil fryer. buy the way do you know how long the used oil will last if stored in my house?? I own and use a Charbroil Big Easy Oil-Less Turkey Fryer. Purchased it last year, because I did not want to deal with hot oil around my kids and the fire hazard associated with the oil. I previously owned a turkey fryer and bought the Big Easy to replace it. No "Hot Oil" to worry about - Safe Around My Kids!! No Oil to Catch On Fire!!! No Oil Added to Food - NO ADDED CHOLESTEROL!!! I was apprehensive when I got mine at LOWES last year, but it's one one the best investments I've made. We've made many great turkeys and roasts with the Charbroil Big Easy. I'm smoking a turkey for 4 hours and finishing it off in the Charbroil Big Easy today. Also cooking a pork roast in it today. It is ABSOLUTELY worth the money. I paid $99 At LOWES. The skin is crisp and meat very juicy, much like a "Broasted Chicken". I don't know who said it was more like a roasted turkey, but far from it. The rate of cooking is about 10 minutes per pound, so a 18# turkey would take approximately 3 hours. 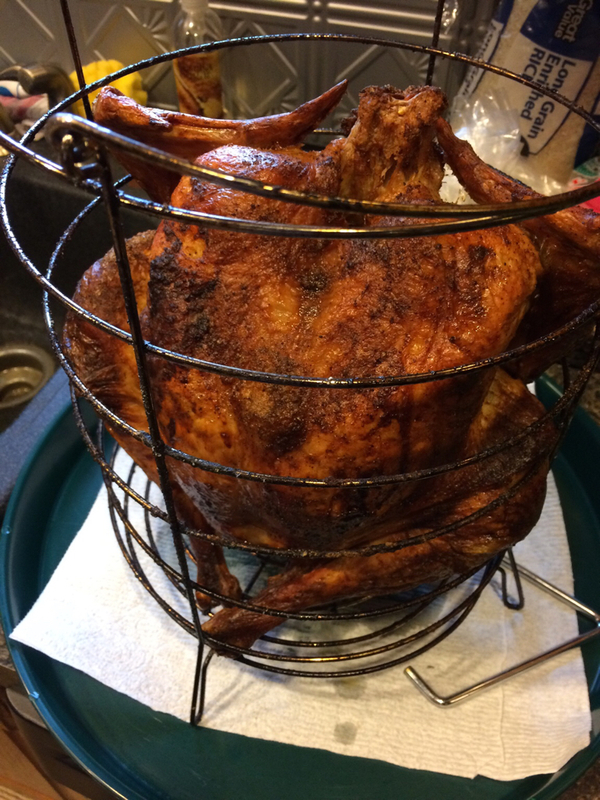 IMHO....You would find it hard to tell the difference between a deep fried turkey and a turkey made in the Charbroil Big Easy Oil-Less Turkey Fryer. Best birds we've ever had! What I don't like is the fact that they're called "fryers". By definition, frying is done in oil or fat. What these are, are a type of roaster/broiler hybrid, a "broaster" if you will. A perfectly legitimate way of cooking a turkey, but definitely not fried. From a marketing standpoint, "Oil-less Turkey Fryer" sounds better than "Broaster". You are correct, it really works like a broaster. Here's what even funnier.....If you cut a hot water heater off at about 24" above the bottom of the tank, this is exactly what the Big Easy looks like. I'll bet someone actually made a cooker out of an old hot water heater, and Charbroil copied it! Did my smo fried bird in it today. I made a mistake and the turkey wasn't done . I inserted probe in the breast at the top of the cooking basket and cooked to 165°. The breast at the end was done on both sides just like the thermo said. The rest was half raw. wondered why the temp was hit in 1 hour 45 min for a 12 lb bird. Lesson learned , Insert probe into the thick part of the thigh and thick part of the breast before putting the bird in the cooker. The cooker use very little propane in two cooks. 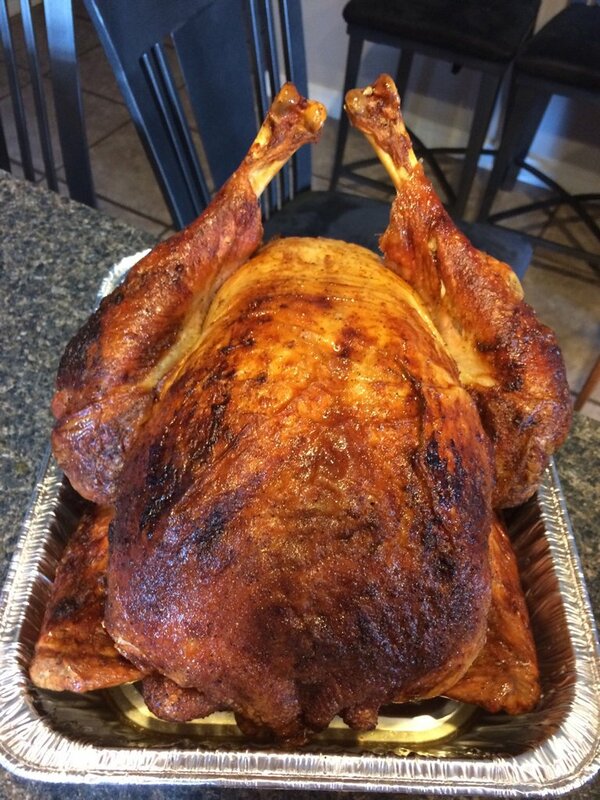 It gives a great crisp skin and juicy bird ,Great flavor. But not the same as deep frying . Also from experiance , Use no sugar or very little in your rub. It tends to turn black from the high heat. Thanks for all the great info everyone. I may take the plunge eventually, just don't have the funds right now. Someone above asked how long oil will keep when stored...As long as I properly filter it out, I've kept oil for almost a year and didn't have any problem. But for the most part, I get oil in the middle of football season and fry one for tailgating, then one at Thanksgiving, then one at Christmas. And that's about all I can get out of a batch of oil. Was so mad at myself for not cooking a great bird thursday ,i did another one friday . Unbrined , injected w/ cajun butter injection, hers and seasonings mixed w/ softened butter and applied under the skin ,in the cavity and on top the skin. This time put my probes in the right spots and , Was a fantastic bird. took about 14 min per lb for a 13 lb bird. The first bird I did in the Big Easy, I injected the breasts with garlic butter. OMG! Great that you had a success on Friday! there is no cholesterol in peanut oil or other plant based oils. Unless you are frying with animal fat, reduced cholesterol is not an issue in the comparison. I'm not exactly sure how they came up with the idea of frying without oil.....but it's definitely not frying. How is cooking a turkey in a little hot box any different from roasting it in a big hot box (oven)? Love the fact that this thread was revived , I have the Char Broil in-fared fryer every year for the past 4 years my Nephew and I have a turkey cook off at Thanksgiving . The first 2 years he kicked my AR SE the last 2 Years I put a Smack down on him . It is all in the Brine the in-fared is not as crispy but much healthier , If you don't care about that fine but we both agree it is all in the BRINE !! I don't understand why ya'll wouldn't just smoke the Turkey? Can't beat a smoked Turkey! I have used the big easy the last three years. Turkey comes out perfect and delicious every time. No oil or mess to deal with. Bird ends up crispy. I also have had a Big Easy for 4-5 years. It does a great job with the turkey. It also does a great job with a pork roast as the fat and edges get that seared crunchy goodness that smells like heaven. I want to try it with a leg of lamb with the rosemary. Thinking about this makes me want to look around here for how it has been used for unique easy cooks. Figured I would follow up in this thread with my two turkeys I cooked in the bigeasy. I injected each the night before with 1 cup butter and 1/3 creole mixed in. Smeared what I couldn't inject over the birds and then dusted with more creole, garlic powder and a little pepper. Turned out delicious for as easy as it was. About 15 minutes per pound. :points1: that looks a lot nicer than mine that I did. It was nice and juicy but not as crisp. I did my 13 pound bird 4 hours and 15 minutes and still just got to 165. Do you place the mesh over the last hour or whole cook?